Juliet Morris was able to break away from her work and give us an exclusive interview about the new Showtime comedy, Kidding, with Jim Carrey, Catherine Keener and Judy Greer. We get to learn a bit about her time on the set as well as what a regular day looks like for her. Juliet Morris will star in her debut role as ‘Maddy’ in Showtime’s new comedy series, “Kidding”, opposite Jim Carrey, Catherine Keener and Judy Greer. The show focuses on the life of Jeff (Jim Carrey) who was a former child television icon and his struggle to now retain his sanity as his family and life falls apart. Juliet will play Catherine Keener’s daughter. BSCKids: Tell us about your role as Maddy in Kidding on Showtime. Juliet Morris: Maddy is very hyper and obedient-ish person and she is very fun to play. BSCKids: Do you have anything in common with your character? Juliet Morris:I do. We look very similar and share some of the exact same features. We like to hide around. We both have wolves as our favorite animals. We both play instruments. 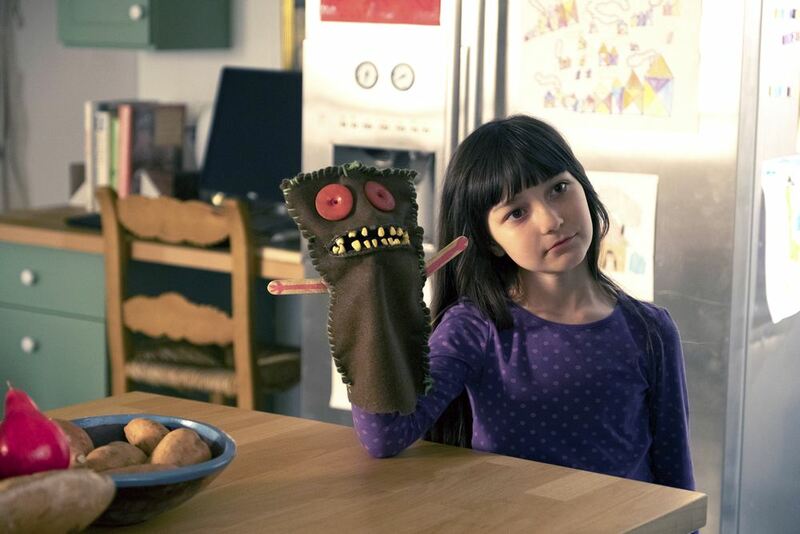 And we both love to make puppets! BSCKids: How is it working with Jim Carrey? Can you tell us the funniest thing he has done while you have been working with him? Juliet Morris:It’s REALLY fun to work with Jim Carrey. He has snuck on me and whispered, “TAG! You’re it!” and he made a funny face. BSCKids: What does a regular day on set look like for you? Juliet Morris:A regular day on set looks like a normal tv studio. After we park, we have to wait a bit till they are ready for me. We go in our trailer, head to set school, and then its’ off to hair and make up. After that its SET time! After set, going home. In her spare time, Juliet enjoys playing video games such as Minecraft and ROBLOX. She likes to also stay active with running, doing gymnastics and even dabbles in fencing. BSCKids: What do you feel like you have learned while working with Jim Carrey, Catherine Keener and Judy Greer? Juliet Morris:I learned to always be brave and believe in yourself. Catherine Keener taught me how to use music to calm myself down when I am nervous. BSCKids: How do you find the time for school work and your friends and family? Juliet Morris:I work as fast as I can. I will also see if I can play with Cole Allen during breaks on set. BSCKids: How do you prepare for your part on the show, do you do anything special to get into character? BSCKids: If you could guest star on any show which one would it be and why? Juliet Morris:If there were a series for “The Nightmare Before Christmas,” I’d like to guest star as a pumpkin ghost. BSCKids: What would you say is your favorite sport and why? Juliet Morris:My favorite sport is running. I practice hard and I really enjoy it. Juliet Morris:How when I was 4, I cut my bangs seven times. No matter how many times my mom hid the scissors, I could find them. BSCKids: Besides Kidding, is there anything else you are working on that you can tell us about? BSCKids: Are you on social media and if so where can we find you? Thank you so much for talking me with. Juliet was very fun to speak with and make sure to check her out in Kidding on Showtime.